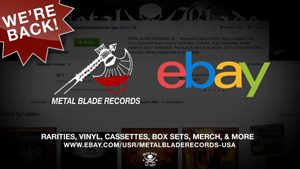 Due to high demand, Metal Blade Records USA has now re-launched their official eBay store, where the label will be selling items unearthed from the vaults and owner Brian Slagel's personal collection. Featuring everything from music (CDs, vinyl, cassettes, imports, out-of-print releases, promos) to merchandise and collectibles, the store will be updated often, so be sure to check back frequently for the latest additions - or sign up for the store's newsletter! To view the Metal Blade Records USA eBay store - which currently has a rare promotional Chris Barnes/SIX FEET UNDER Bobblehead (http://goo.gl/2c2Uh7), ANACRUSIS' Reason on CD, ENGINE's self-titled/Superholic as a CD box-set, AMON AMARTH's Wrath Of The Norsemen as a DVD promo, AS I LAY DYING's An Ocean Between Us as a limited edition import (with lanyard), an official Metal Blade Records trucker hat, IN EXTREMO's This Corrosion as a German radio single, and RIOT's Inishmore/Sons Of Society on CD, go HERE. Founded upon owner Brian Slagel's enduring drive to find great bands and get their music out to as many people as possible, since 1982 Metal Blade Records has brought wave after wave of powerful, innovative, and often genre-defining music to the ever-hungry metal masses, including CANNIBAL CORPSE, GWAR, AMON AMARTH, and many more. It is this ethos that has seen Metal Blade build up a stunning and diverse catalogue, weather the various storms facing any independent label, and in an age of declining record sales boast the most successful years of its existence as it strides into its fourth decade. "How important is Metal Blade to our career? They're only the reason we are enjoying the worldwide success we have today," states METALLICA's James Hetfield.